Arrived by air into Adelaide Monday morning and drove 3 hours back home to Gurra Downs. It seems I have been away a very long time, particularly when greeted by the weeds in the orchards and other work awaiting my attention - but it is fantastic to be back with my family in my favourite part of the world. I owe a lot to my Nuffield Farming Scholarship. As I reflect on this amazing trip of a lifetime I realize how much I have grown and gained from the experience. Before departing on my scholarship, initially I struggled with the concept of being way from my family and farm for such a long time (over 4 months). I was concerned about who could do my work and cover for me when I was away. Now I have returned with a clear direction on the best ways to proceed in terms of how to manage opportunities for further growth and how to minimize labour/cost inputs in our date plantation. I have no doubt in crediting my time away as being a very good investment in the future of our industry. I can also conclude that my being away has also empowered our business as my wife Anita and other family members were challenged to extend their usual duties to cover mine in my absence - which they did commendably. This is reassuring to me because if for any reason I am unable to contribute to running our Gurra Downs Date Company business then my fantastic family could manage without me. Many thanks go to my family who by taking on extra, afforded me the opportunity to participate in my amazing Woolworths sponsored Nuffield Farming Scholarship. 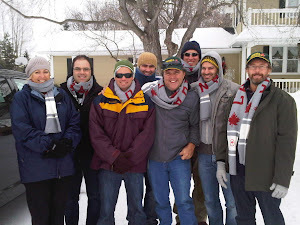 Special thanks to my wife Anita, sons Shaun and Jonte, daughters Jesse and Kelsey, parents Brian and Ruth, friend Oscar. Next stop: United Arab Emirates (UAE). 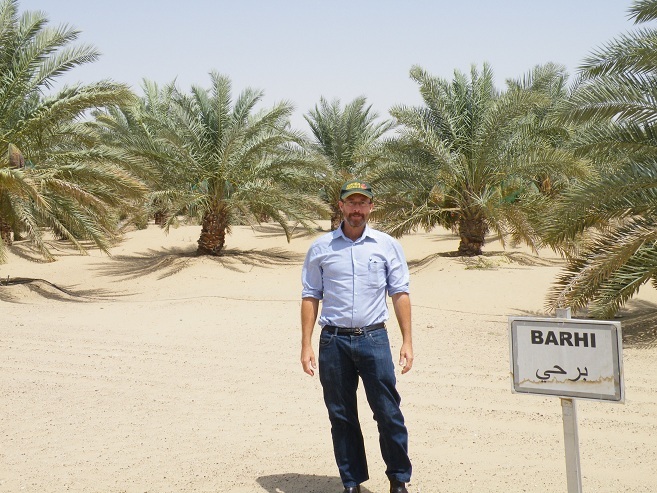 I have visited the UAE 4 times previously to attend date conferences, expos and to look at characteristics of some varieties. This trip I wanted to follow up on a couple of projects. I first met Tony Portman who works for the Abu Dhabi Farmers Centre (ADFSC) a couple years ago when he was still with the Western Australian Department of Agriculture. His job now involves assisting local date growers to become better farmers through education - providing materials and contract labour to improve irrigation, fertilization and pest and disease control services. 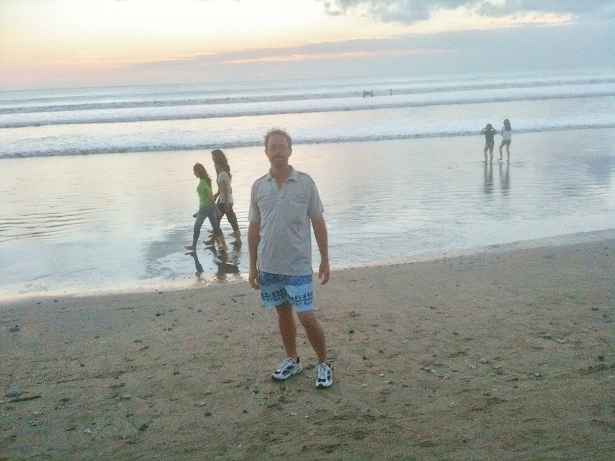 Tony speaks Arabic so he is just the person to speak to about the latest plantation management and cultural practices. 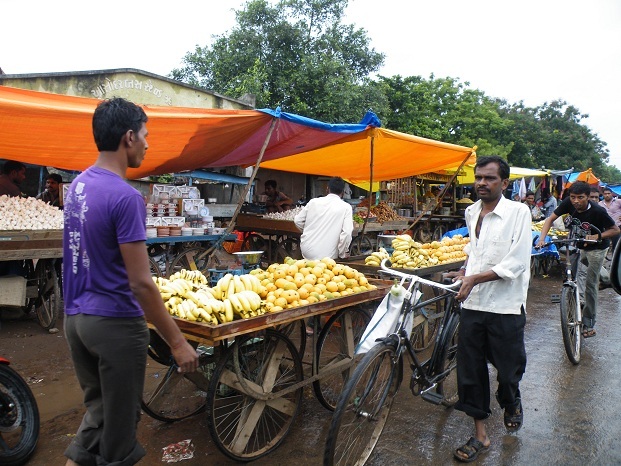 The ADFSC also has a marketing division which sells the farmers' produce. ADFSC has been successful in raising the national standards particularly in the area of irrigation efficiency and these acheivements have been recognized with being awarded this years Khalifa International Date Palm Award. 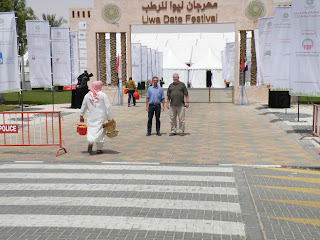 I deliberately timed my visit to coincide with the Liwa Date Festival. 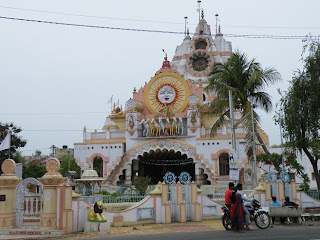 I have fond memories of this festival from my 2009 visit and was keen to return. Liwa is a small regional town 3 hours drive from Abu Dhabi on the Saudi Arabian border. It is also at the start of the Empty Quarter which is some of the most hostile desert country on the planet - hot and dry with drifting sands. 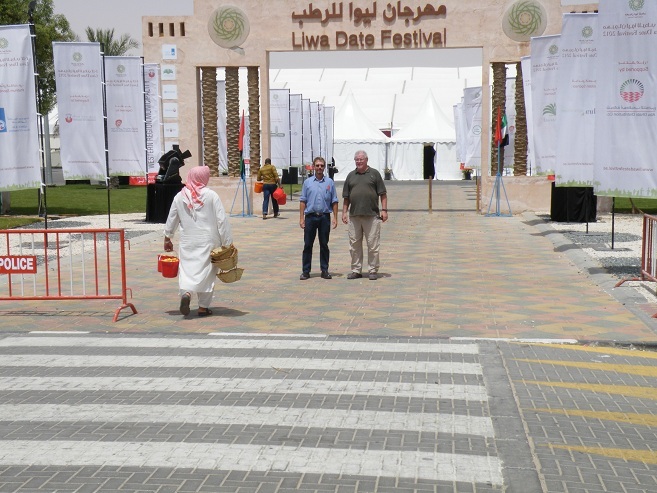 The Liwa Date Festival is a celebration of the heritage of the traditional people and the intrinsic connection they have with the date palm. 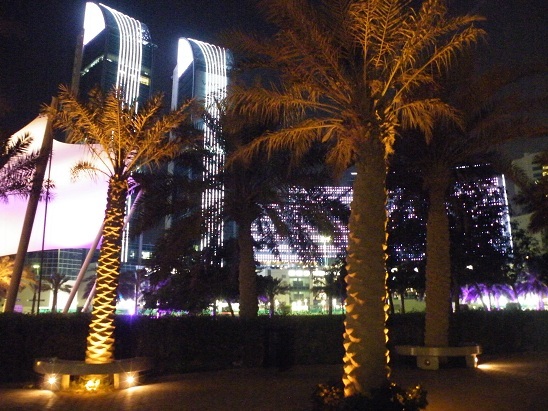 Before the modern era of oil, people of these desert regions relied on the date palm for their very existence. The Liwa Date Festival coincides with the start of the date harvest and there is great excitement over the arrival of the new seasons fruit. There are a number of categories of fruit which are judged at the festival. There are many entries in the competition and the winners for each variety and the heaviest bunch win a brand new 4 wheel drive vehicle each. 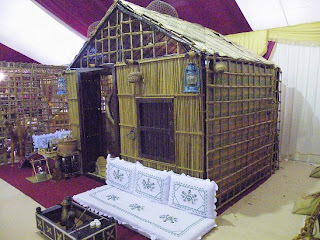 There is also a competition for dwellings built from date palm fronds - which is the traditional way people lived. There are a few different styles of dwelling - this depends on whether they are designed as permanent residences or nomadic shelters. The date palm is truely a very resourceful tree. I enjoyed my time at Liwa. Next day I spent with Tony and other staff from the ADFSC and had very useful discussions on the latest irrigation recommendations. Also had interesting discussions on the marketing of fresh dates into high value markets and how the Australian counter-seasonal fruit could potentially be available at a time when there is little northern hemisphere product around. 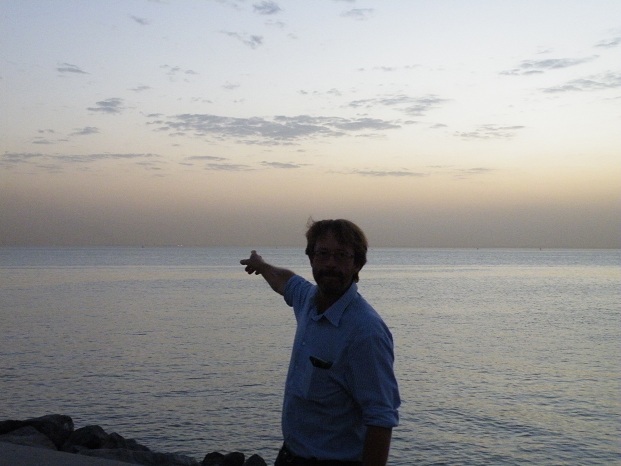 I would like to thank Tony Portman and staff for very kindly hosting my visit and transporting me to Liwa. 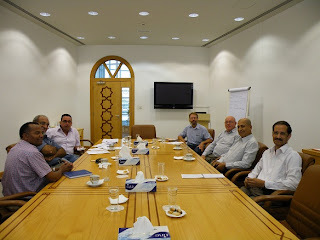 The following day I travelled by bus 1 and 1/2 hours to Dubai to visit the International Centre for Biosaline Agriculture (ICBA). This centre focuses on practical production practices in saline environments. It is more than just another research institute that runs interesting research trials. The ICBA is involved in rolling out on-ground projects in the UAE as well as many other countries - empowering local people through education, demonstration and the supply of drought hardy/saline plant species. 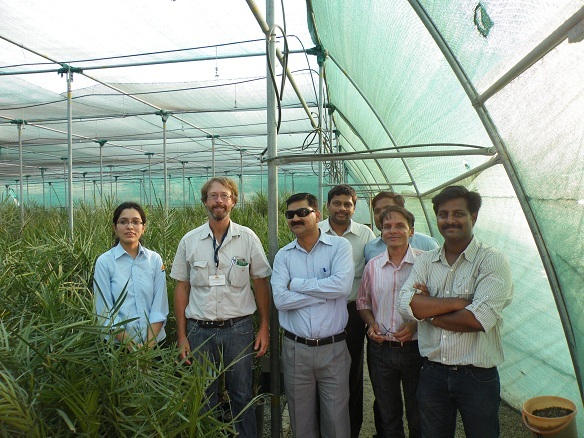 The ICBA employs a wide range of scientists, economists, researchers and irrigation specialists etc. Their well respected work is mostly on fodder crops for livestock grazing systems such as grasses, legumes, shrubs and trees. They have many Australian native plants in their working collection. 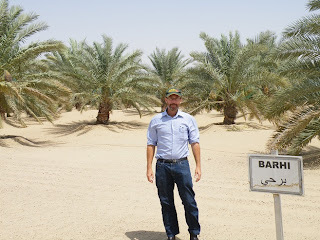 They also have well established salinity trial work on date palms which of course is my main interest. Our own irrigation water quality from the Gurra Gurra Lakes has at times been terrible - up to 5500 (EC) electrical conductivity units. 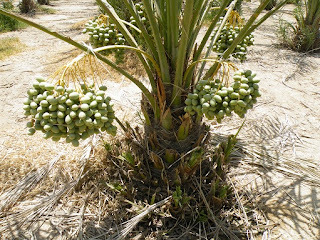 I know date palms are salt tolerant from our own experience but what has the ICBA got to say about salinity tolerance? 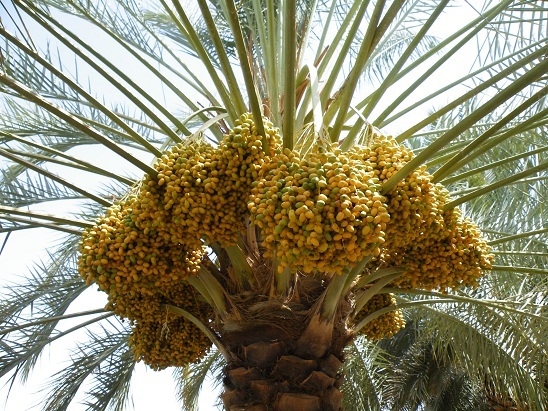 The ICBA runs trials growing date palms at 5, 10 and 15 decisemens so with one decisemen equal to 1000 EC units, that conversion equates to trials at 5000, 10000 and 15000 EC units. Upon visual inspection of the 5000 trial there were some signs of leaf scorch on lower leaves, possibly from salinity burn, but palms were still producing fruit at high levels. However the same couldn't be said for the 15000 trial - palms were noticably smaller in height and canopy, and on some varieties was near zero fruit whilst other varieties still demonstrated reasonable fruit yield. It can be concluded that some varieties are more salt tolerant than others. I had the opportunity to meet with many of the staff and shared in a valuable exchange about productive saline agriculture. 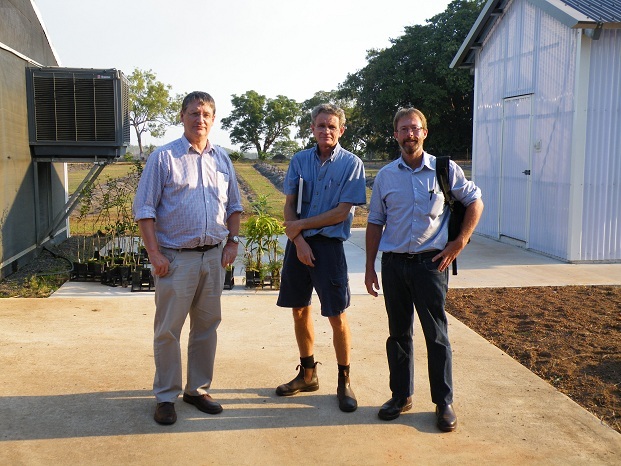 After talking to these scientists/specialists and seeing the trials, it has strengthened my views on our current irrigation methods in the Riverland. Sure we as a region are 85% irrigation efficient which is outstanding, however we are still wasting much of the remaining 15%. Worse than this, we are paying for it to be collected through the existing drainage systems already in place then pumping it along with its moderate salinity load, back onto floodplain environments or to evaporation basins where the majority of this water soaks into the ground and heads back toward the River Murray. 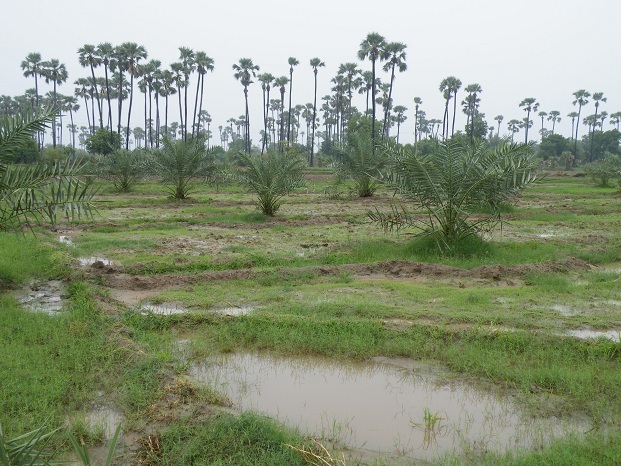 My understanding is this irrigation drainage water amounts to several gigalitres regionally and the quality is variable but in general terms is well within the tolerance levels for date palms and some other crops. It is hard to believe that with the water shortage throughout the Murray Darling Basin, we are still wasting this volume of Riverland drainage water and disposing of the salinity within this drainage water, back into our river environment. At the same time Government is spending millions of dollars building salt interception schemes to remove salt away from the river system. We have a lot to be proud of as an irrigation community but not utilizing our drainage water is preventing us from taking our regional irrigation efficiency from 85% to perhaps 95% or even higher. 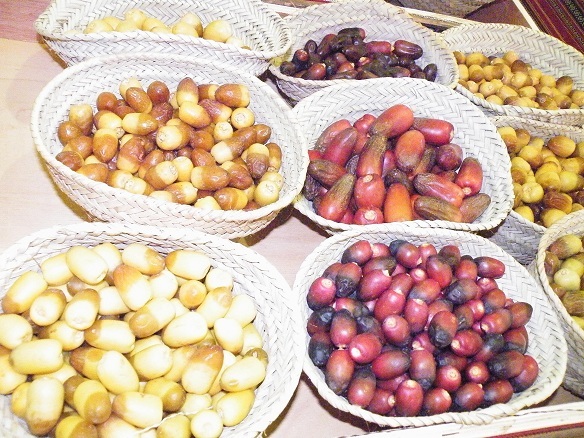 In recent years there has been a lot of activity in the Indian date industry. India is a large global importer of dates - approx 250,000 metric tonne annually however it has a very small production base. This is perhaps surprising given the large western desert region adjoining Pakistan. An initiative by India's oldest company Atul Ltd in a joint project with the Rajasthan Government is changing this. They have established a tissue culture lab and nursery at Jodhpur and established commercial plantations and demonstration sites at strategic locations. 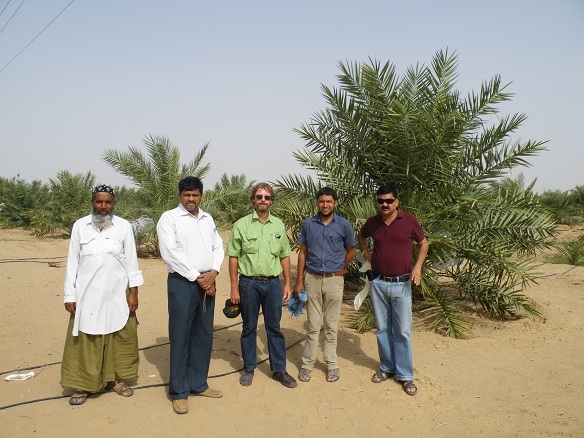 Atul Ltd were honoured for their development project in 2009 when they were awarded the Khalifa International Date Palm Award which was recognizing the merit in this project. Atul also own DPD Ltd UK (Date Palm Developments) whom we have been a customer of for the last 12 years. Atul were agreeable in hosting me for a few days. My Indian adventure began with flying from Muscat to Doha and then onto Delhi before a domestic flight to Jodhpur. This is a desert city of approx 1.5 million people. 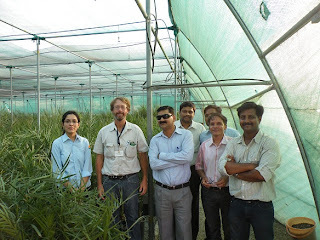 I was met by Atul staff and taken to see their tissue culture and nursery facility. This photo: Me with Atul staff in Jodhpur. I was soon to learn how many similarities there are between the Indian and Australian date industries. Like us, their major impediment to industry growth has been a lack of suitable planting material with which to establish plantations. Atul together with the Rajasthan Government has identified this, formed a funding partnership and built a world-class, high capacity date palm nursery facility. They have also set up a commercial plantation which serves as a variety trial site as well as an educational demonstration site to encourage other growers to participate in the industry. I could really relate to this project as we are doing exactly the same in Australia - the major difference being the State Government of Rajasthan were supportive of this project which accelerated growth. 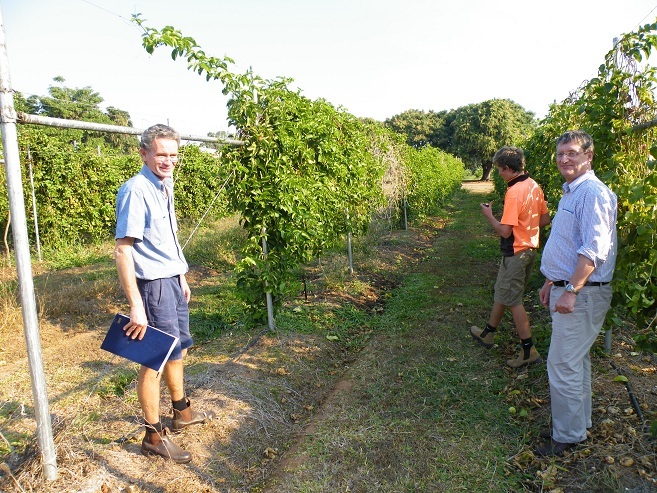 Whilst we have received some good support from our Federal Government, at this stage our SA State Government has passed up the opportunity to co-contribute in the Australian date industry development project. 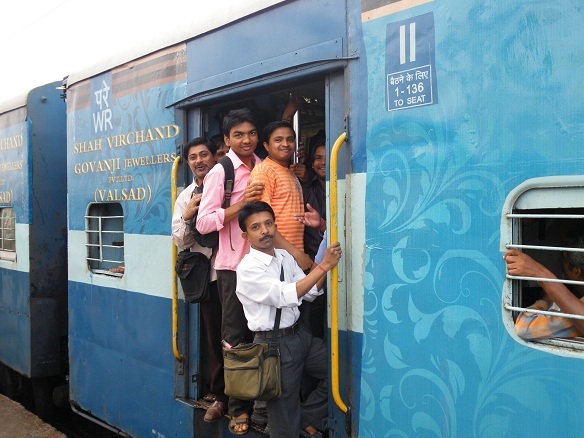 The Rajasthan Government recognizes the vast economic and employment opportunities being created by this partnership. The new Jodhpur tissue culture lab is fantastic. Everything is state of the art with solid quality assurance procedures in place. 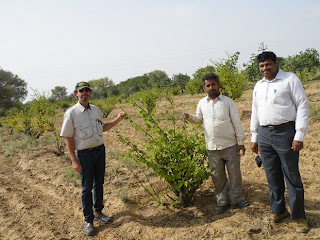 The outplanting and nursery area function well with good plant number turnover due to the demand from farmers. This facility employs leading technicians for every aspect of producion. They also fly in experts from other countries to provide further depth of competency. 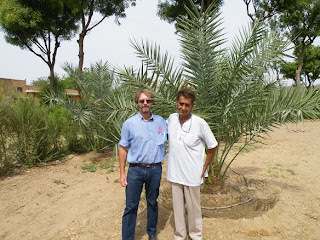 Next morning we met with a local Jodhpur farmer who is growing several varieties and getting amazing growth rates. We spent the afternoon driving deeper into the great Indian Thar Desert some 260km towards Bikaner. This desert country still gets some effect from the southern monsoon season - receiving 200-300mm but only in the wet season. For the rest of the year white sands remain parched. There is some vegetation growing 3-4m tall but trees and shrubs are generally sparse. Unlike other deserts this region is well populated. Life is hard here but there are lots of enterprising people trying to make a living. Everyone is happy to see us. ...........then there are cattle, goats, sheep, camels and dogs which seem to spend as much time on roadways as off. 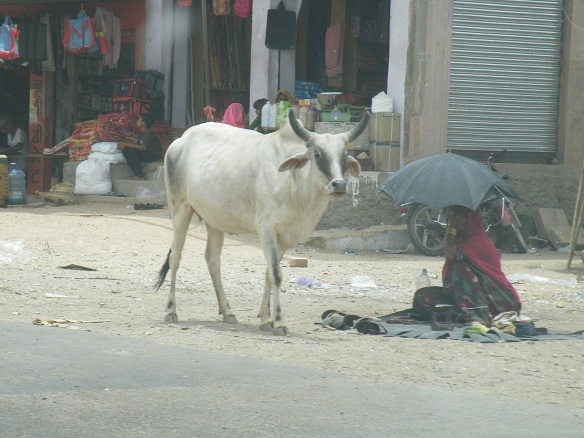 Of course cattle in particular are a sacred species so freely roam as they please. 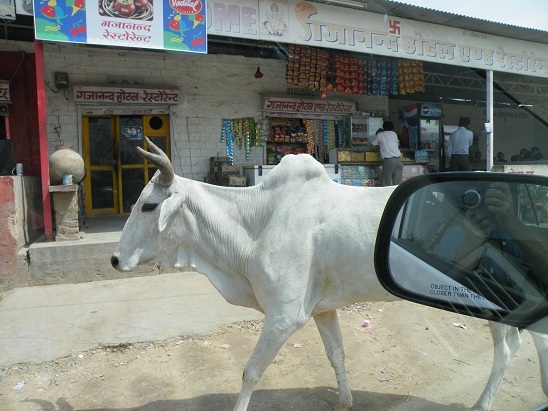 They can often be seen living carefree lives resting in the middle of major motorways or in and around shops etc. 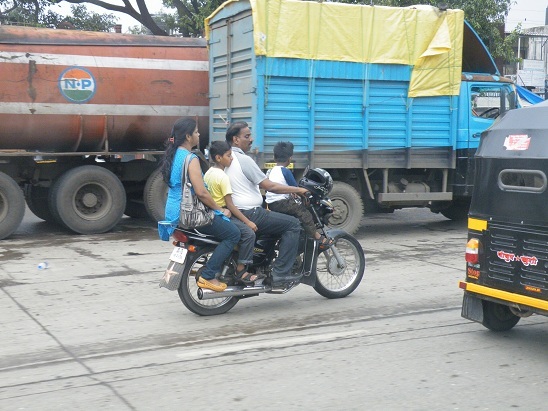 They are accustomed to being driven around and seem to know they have right of way. 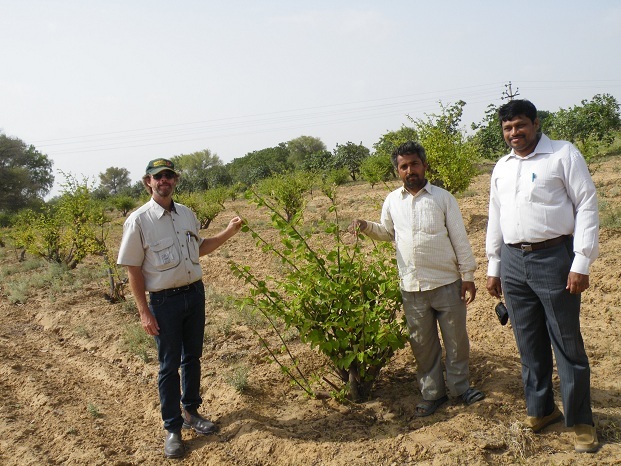 Atul has established a plantation near Bikaner (population 1 million). These are mostly 2 yr old tissue culture palms, several varieties we also have at home. The palms are growing very well, even faster than ours. Water supply is good quality and the winter months are moderately warmer than the Riverland, making for better growth rates. 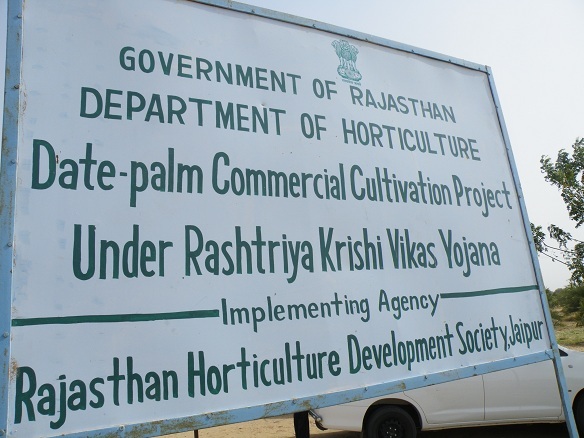 This site also services local growers from around Bikaner to showcase date production. 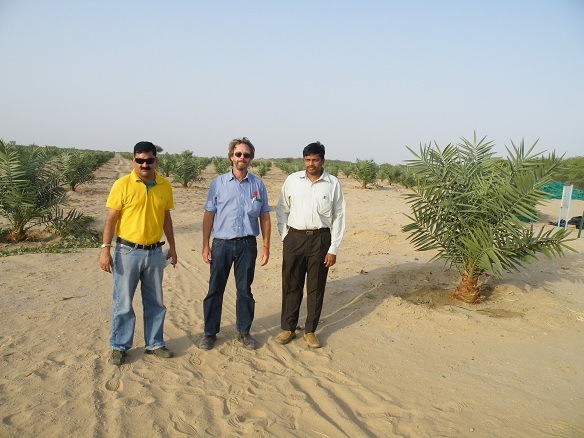 This photo: at Atul, Khara Bikaner Date plantation. B.K.Maheshwari, myself, Dr. Muhammad M. Khan. We then visited a private plantation where the farmer is cleverly intercropping with pomegranates which although young are starting to bear fruit. This system allows cashflow to begin at an early stage while waiting for the longer term date palms to commence. At this site palms are planted with 8m x 8m spacing so the intercrop system does restrict machinery access but has substancial benefit in creating an early income stream. The next day we headed toward Jaisalmer and visited a very impressive date palm commercial cultivation project of the Government of Rajasthan. 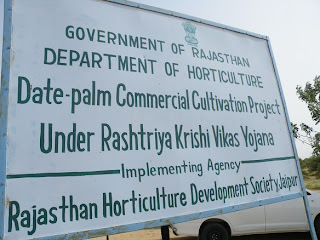 It must be recognized this is a new crop to this region so I give the Rajasthan Government very high marks for this initiative. Their aim is to create economic and employment opportunities for the local people. 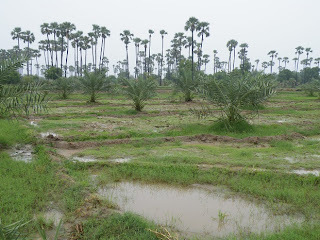 Palms at this site are 3 years old and already some have given a light crop with promising results. Judging by the visitors book I signed, there's lots of interest in this project from all over the world. They are also soon to build a Centre of Excellence where local farmers can be trained in the management process of growing their crop. 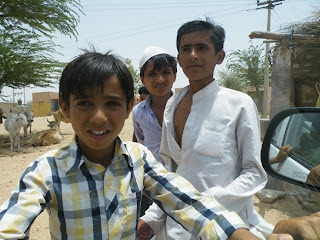 We spent the night at Jaisalmer, a further 300km beyond Bikaner and only 100km from the Pakistani border. Here the rainfall is even less - maybe only 150mm per year. Current temperature is 40 degrees Celsius. 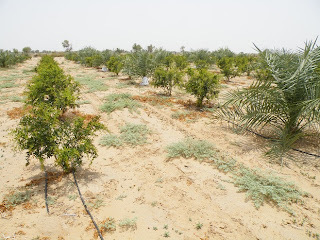 Next morning we looked at another private grower's organic plantation where he intercrops between the date palms with limes, gooseberries, chinese dates, gumball fruit, cucumber, aloe vera and peanuts.This is a very diverse and dynamic property. He is also constructing a hotel to cater for agri-tourism. He already receives many guests to look at his farming operation. We later drove another 6 hours back to Jodhpur. This photo: Chinese Dates growing alongside date palms. Next day I flew to Mumbai to meet with Atul staff at the main corporate head office. Leaving behind the dry western desert, a 2 hour plane flight later I was in Mumbai at monsoon season time. This is a lush rainforest/agricultural area supported by approx 2500mm annual rain. 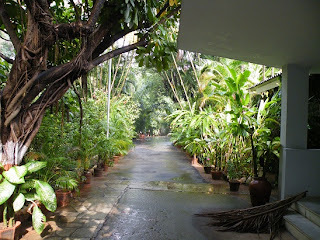 The monsoon season although late, had broken. 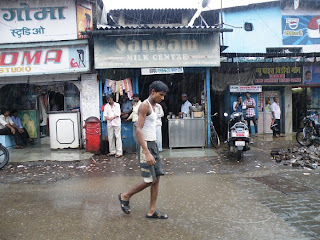 After exiting the airport we drove 3 and 1/2hours through tropical rainfall to the town of Atul. 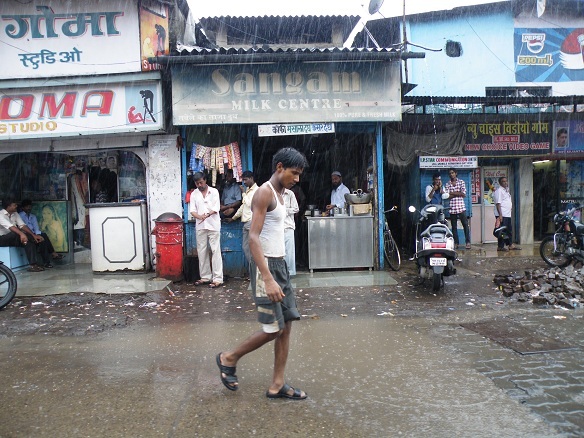 This photo: monsoon season in Mumbai. The company Atul Ltd which had its beginnings in the textile and coloured dye industry employs so many people it now sponsors a whole town of around 1100 houses - schools, medical centres, banks, sporting facilities and even has its own train station. I was accommodated in one of their guesthouses. The General Manager of Business Development, Dr Batra, provided me with the background of this amazing company which is India's oldest company. It is now diversifying into agriculture including the date and banana industries. This photo: from the desert to the tropics - superb gardens at the Atul Ltd guesthouse. 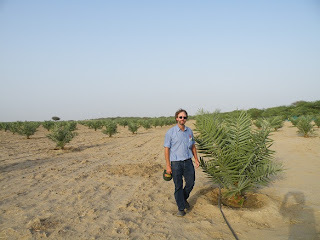 The next day we drove 300km to look at date palms. Now anyone worldwide who knows anything about date cultivation knows you need hot, dry conditions with very little rain - so I was more than curious to see what is being attempted at a commercial plantation in this environment. Our first stop was a farmer who had some years earlier established a plantation from seedling palms which he germinated himself, so there were no known varieties. I was surprised to find a good amount of fruit on the trees. All of the fruit had successfully reached the khalaal (semi-ripe) stage of maturation. We taste tested many of these seedling varieties and some were quite good. Amongst internationally known date varieties there are perhaps only 2-4 which are commercially sold at this khalaal stage because unlike other varieties, the fruit is sweet and without objectional astringency. This farmer is selling some fruit from his seedling varieties for local consumption and he may well have discovered a new variety suited to this location. In my mind he has importantly demonstrated it is possible to produce khalaal dates that can be harvested before rain spoilage associated with the start of the monsoon season. 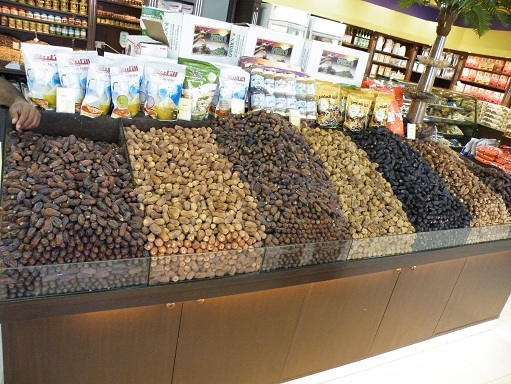 This opens prospects for growing the world famous variety Barhee for fresh khalaal dates. This variety is traded in huge volumes but I am unaware of any production occuring anywhere else in the tropics. This farmer has also interplanted with mangos and coconuts. It is the first time I have seen tropical species and date palms lined up next to each other quite like this. Then back in the car and onto the next stop. Another farmer has planted tissue cultured Barhee and other varieties which are now 2 yrs old. Although fruit production is probably 2 years off, if successful, this will change all perception of date cultivation and open up enormous possibilities to grow dates in tropical parts of the world. I will follow this one with keen interest. We drove back to Atul town for my last night in India. I'm very grateful to Dr Batra and the entire Atul team who showed me around for these few days. From the time I was collected from the airport at first arrival in Jodhpur and dropped at the Mumbai airport to depart, I would like to thank you all for your fantastic hospitality. I had a very enjoyable trip and learned heaps. I hope to continue to hear of future successes in growing The Blessed Tree. 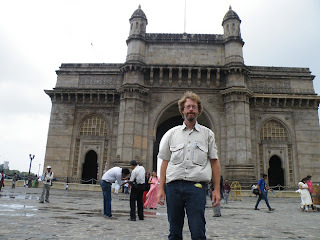 This photo: Here I am at the Gateway to India. 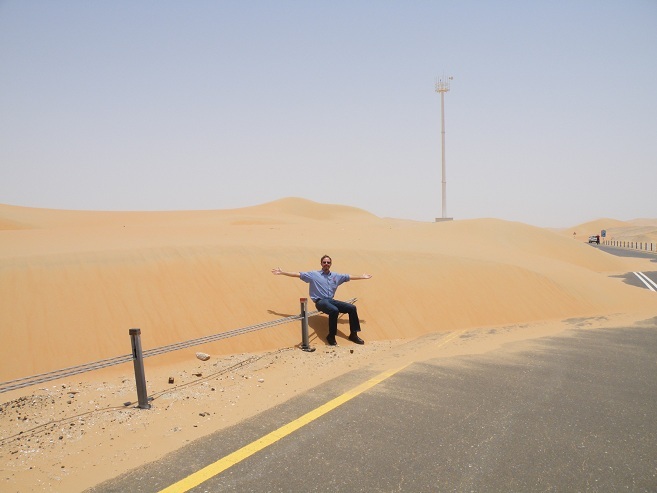 My next stop is the United Arab Emirates - beginning to count down the final days of my Nuffield Scholarship tour. I flew into Muscat, Sultanate of Oman for a 4 day stint. We have in our Australian date palm collection, quite a number of Omani varieties so I was keen to see how these are managed in their home environment. I had previously made arrangements through the Ministry of Agriculture who kindly agreed to provide me with the opportunity to see their date industry. 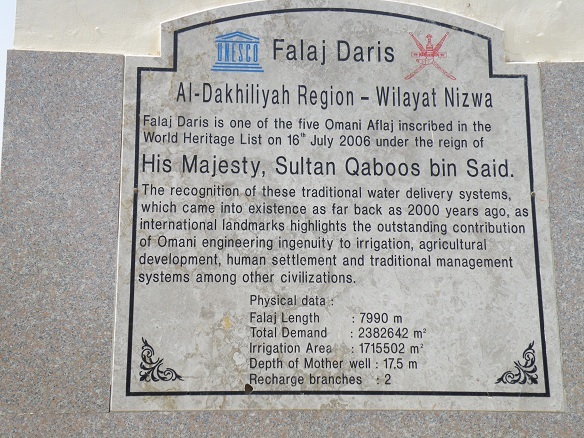 We began by driving to the interior to visit the major date growing region and govenment research station at Nizwa. Oman is certainly a beautiful country. We left the sandy beaches behind and drove through spectacular mountains. In fact during the entire 2 hour drive we were continuously driving through mountain ranges in desert country. June and July are their hottest months and Muscat didn't provide me any discounts ontemperature. One one day the mercury reached 49 degrees Celsius and the other 3 days were similar! The interior is a drier heat but in close to the coast they have high humidity levels. This photo: Masoud and I at Nizwa. 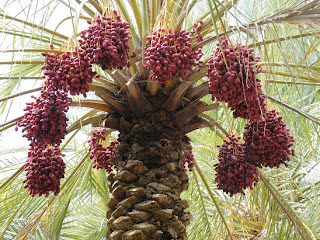 Oman is home of the earliest ripening variety of date called Nagal - which I'm pleased to say we have in our collection. I was surprised to hear from staff that they have already been harvesting dates for more than a month. 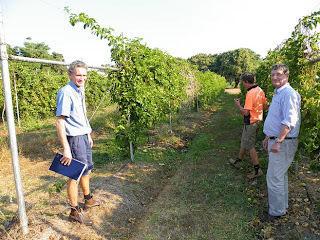 Other countries I have just visited were suggesting fresh dates have a further 3-4 weeks before harvest will begin. 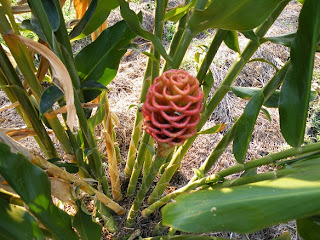 This photo: fruit close to ripe. Upon arriving at the Nizwa Research Station I was invited to enjoy Omani coffee and fresh dates. I cannot explain how much I have been looking forward to gorging on new-season fresh dates! 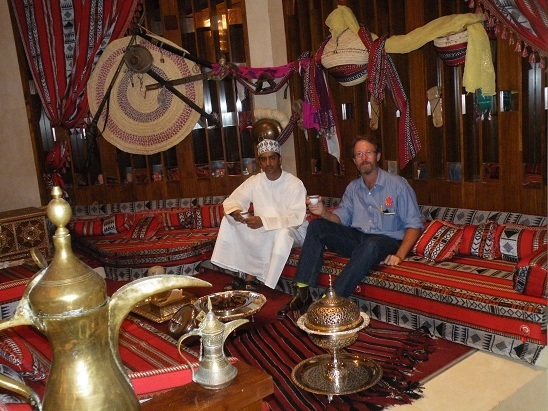 This photo: Dave and Haitham (Dept of Ag enjoyin coffee and dates. Most Australian's are not familiar with this fruit style known as 'khalaal' or fresh dates. They are sweet, crunchy and juicy but only available for a few weeks of the year before the dates ripen beyond this stage to fully ripe or dried dates. 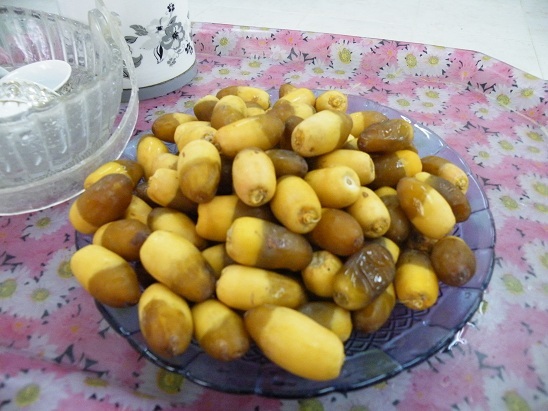 Each year anyone who knows dates, hankers for the first of the new-season fresh dates and I'm no exception! We toured the tissue culture and nursery facility and visited the gene bank repository where there are something like 260 Omani varieties. 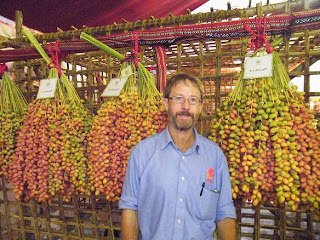 I discovered some varieties of early ripening dates which would be of interest to our own Australian colection. 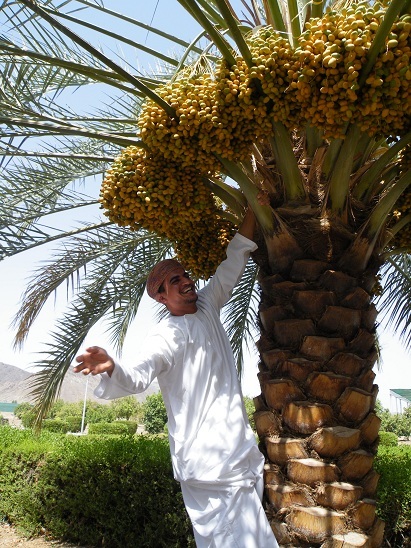 This photo: Masoud picking dates. I was also given a demonstration of offshoot removal techniques and taken to see another 2 local plantations. Drove back to Muscat late in the day. 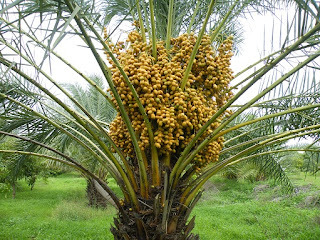 A date palm laden with ripening fruit is an attractive and colourful sight. Fruit can vary from bright yellow, orange or even red. One cannot help but be impressed by the massive bunches of fruit hanging - with sometimes as much as 200kg being produced by a single tree. 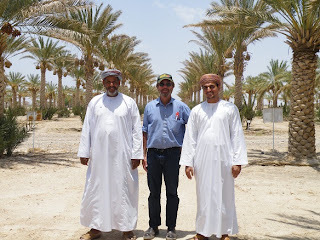 This photo: Dave wih Mohammed and Masoud at the Goverment plantation at Nizwa. 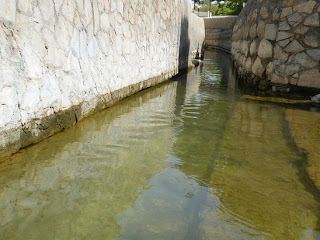 Irrigation channel which is about 2000 years old and still in use. Info on irrigation water supply. The following day I met with senior Ministry staff at the Dept of Agriculture head office. We exchanged cultural notes and I obtained an extensive set of date palm research and a management publication for which I am most grateful. This will be a very useful resource. The staff were most helpful and accommodating. 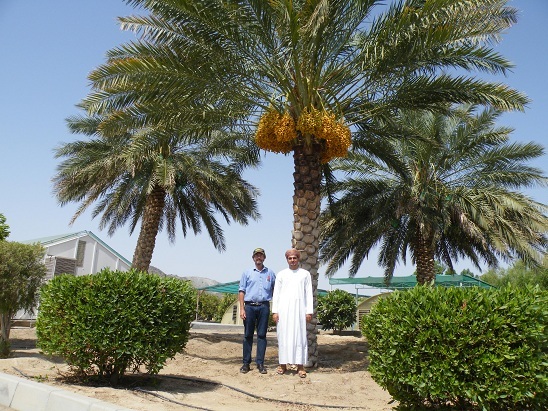 This date palm department is well funded by government and employs many experts and researchers - with date production being the most important agricultural crop of Oman. I spent the evening looking at local attractions including the premier international hotel, beaches, harbour and old souk. 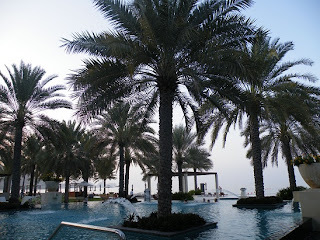 This photo: palms growing in hotel pool. On my final day I met with 2 other officials - one an expert on plant breeding and the other is a regional coordinator for ICARDA (International Centre for Agricultural Research in Dry Areas). We discussed ways of exchanging information and being included in the network with possible future workshops and tours. I really enjoyed my time in Muscat. 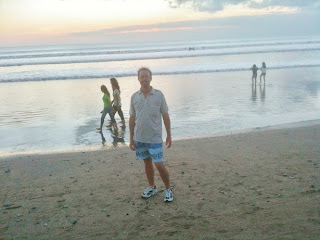 The people are very friendly and road infrastructure and transportation make it easy to get around. Muscat would be a fantastic tourist destination in winter months when temperatures are mild. 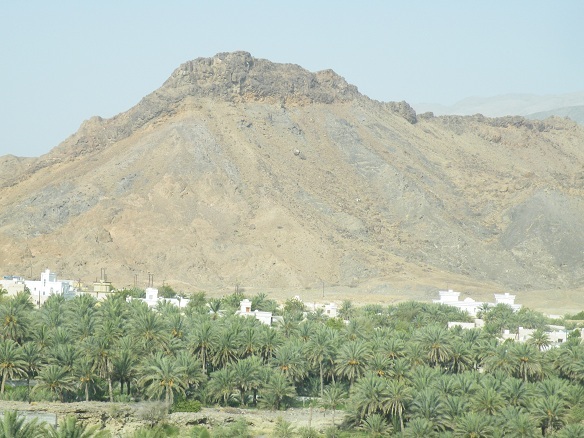 During the extreme heat of June/July tourists flock to Oman's tourist resorts 1000 km to the south near the Yemen border. There apparently the climate is much kinder during summer. I hope to discover this for myself if I ever have the good fortune to travel to this part of the world again. My reason for visiting Kuwait was purely to meet again with Dr Sudhersan who works for the Kuwait Institute of Scientific Research. I previously met him following a presentation he delivered to the Fourth International Date Palm Conference in Abu Dhabi in 2010. The topic was his work on date palm hybridization where he is achieving interesting varietal traits. I was fortunate Dr Sudhersan agreed to show me around his facility and allow me to look at his progressive work. 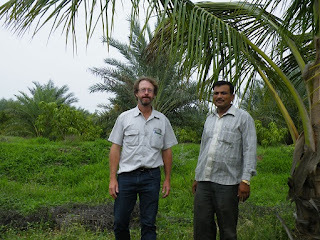 This photo: Dr Sudhersan and I looking through his experimental plot. Dr Sudhersan shared with me some insights into date palm management and was able to provide some answers and explanations to questions and teething problems in relation to date palm management that I've been having. 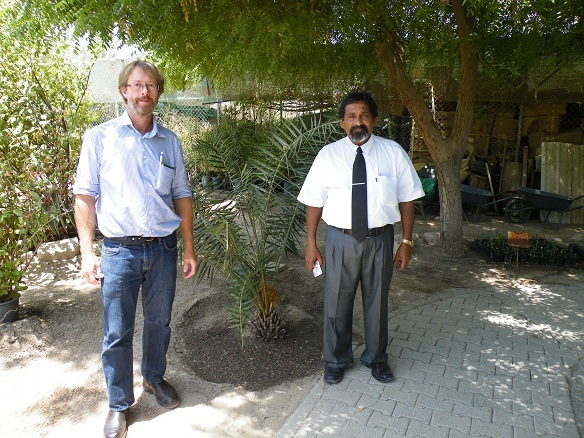 We inspected the Institute's tissue culture and nursery facilities before walking through his date palm trial sites. This photo: example of intercropping. I continue to be amazed with Dr Sudhersan's projects. He is one of the most creative thinkers I've ever met and his trial plantation is full of different useful plant species - most I've never heard of. 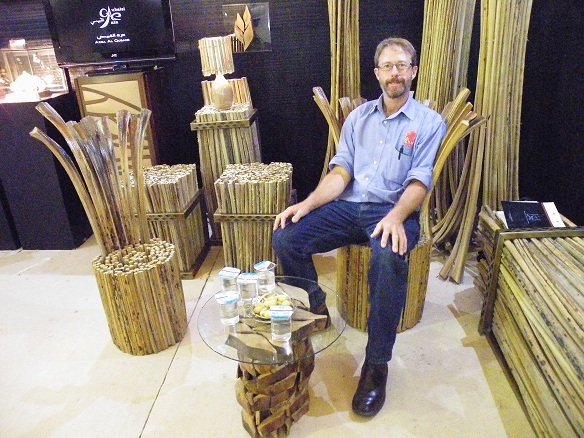 His collection features many medicinal trees and shrubs plus edible fruits. 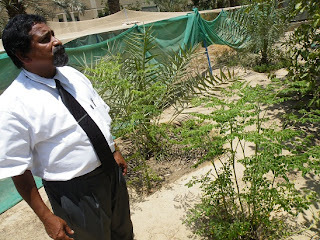 Dr Sudhersan has even successfully acclimatized some tropical species, cleverly grown beneath the shade of date palms. His date breeding projects include a dwarf date palm and a seedless date palm variety. 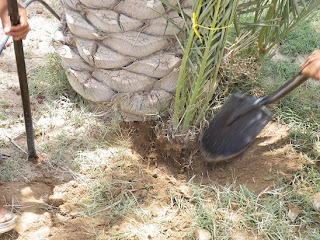 This photo: young palms cropping. Dr Sudhersan has also implemented a pilot project to combat desertification using a range of indigenous plant species to green the desert. I hope he can continue this valuable work and share his knowledge with the rest of the world. Kuwait is a modern city still rebuilding itself following the Iraqi invasion when almost all of the original city was destroyed. New buildings in the CBD areas are attractive and energetic. At night some of the skyscrapers dazzle with coloured light displays vibrantly moving beween buildings and giving the city and harbour a 'Las Vegas-like' glamour. Kuwait's harbour and coastline supports a bustling fishing industry with bountiful hauls and diverse fish species on the menu all year round. During summer Kuwait is extremely hot with the most active time of day being after sundown when people emerge from the air-conditioning and walk and talk and dine until late in the night. This photo: pointing to Iraq - just across the gulf. Dr Sudhersan drove me around markets where I sampled many different date varieties. 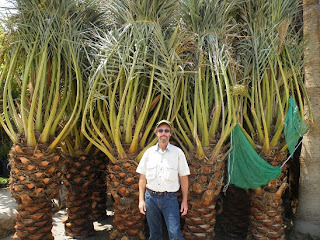 We also visited nursery markets where fruiting and ornamental palms are available for sale. Thanks to Dr Sudhersan for looking after me and showing me around. I very much look forward to staying in contact and following his most impressive work. Incredible. 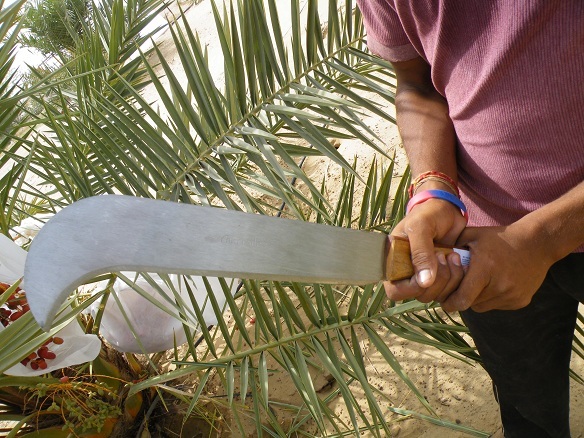 Next stop: Oman This photo: ornamental palms ready for sale.